This is a relatively uneventful turn for me. I retake the swampland and drive Lanka back onto his island, stoppering up his evil minions for another turn. I am not, however, confident enough to pursue him across onto his island because I know that he will use defensive movement to bring all his forces to bear. 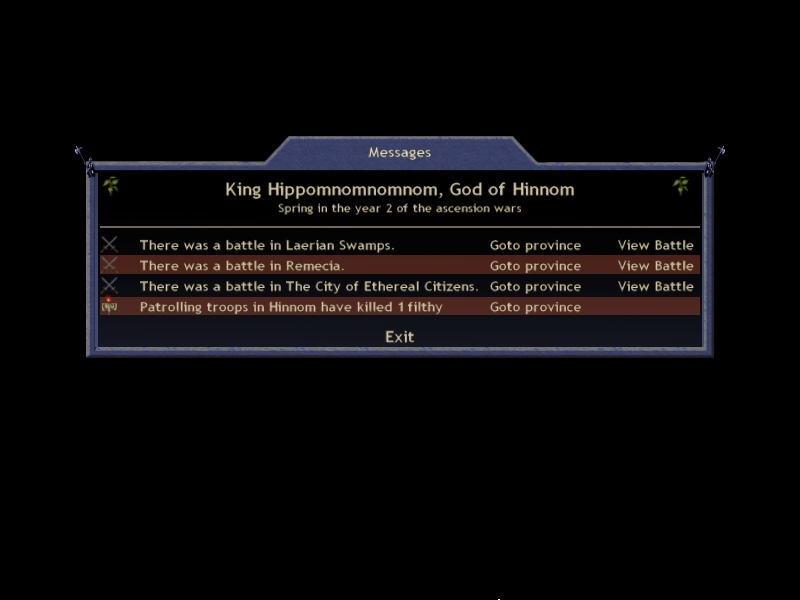 I'll leave TheDemon to discuss his run in with Sauromatia, but as you can see he won the battle in Laerian Swamps (the mideast province on the island). DIE MONKEYS DIE! and STILL DIE MONKEYS! hang out on my side of the bridge patrolling with their caveman friends. In my capital, new recruit SKROOB! heads to the forest to root for truffles and contemplate not eating my cap population. You can see that I took one of the cordoned off indies, the City of Ethereal Citizens. I consider putting my Melqarts there but those fat bastards are fairly inventive and would probably find some way to eat ethereal citizens. Down south I'm recruiting independent archers to go kill those two barbarian provinces. 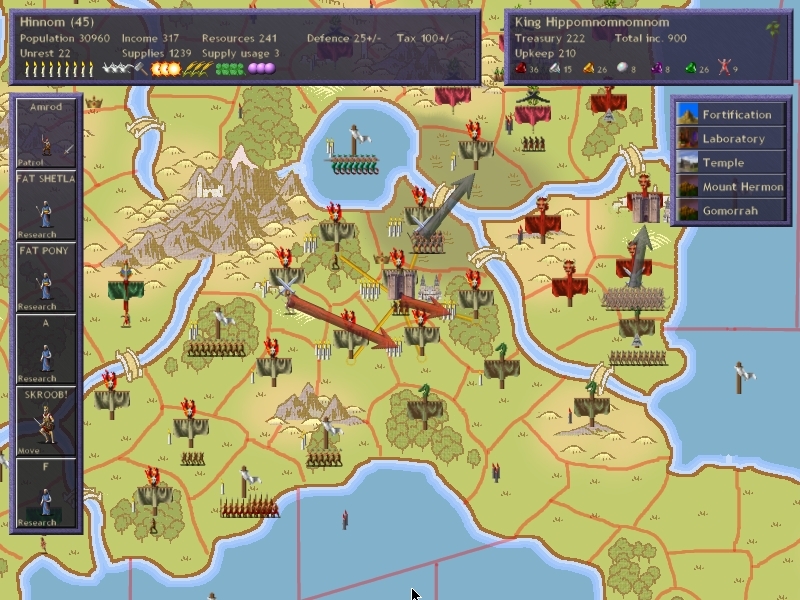 I need all my capital recruitment for fighting off TheDemon but I still need to take the three provinces I've cordoned off and tiny archers are a decent way to do it. OM NOM NOM! the prophet heads north, inspired by his God to undertake the most secret of missions. Were sauro not threatening, I would have continued the march on hinnom. So BC is saved by his diplo efforts earlier in the game. 2. keep up with three other players in any kind of war of attrition. After Feinne recused himselfturned yellow and ran, it was two on one. If either Dawkish or I blink then TheDemon is going to quickly eat the other and I'm betting dollars to donuts (mmm, donuts) that he won't forget the other player's role in this fight. So we have a bit of a prisoner's dilemma going on. Fortunately for me, Dawkish and I are fairly friendly and were recently teammates in another team game that we won so we know we work well together. Unfortunately for me, Dawkish is also teammates with TheDemon in another game. Still, once I'm on someone's side I'm a pretty loyal ally and I'm in this for the long haul so I grit my teeth and confess nothing. I'm betting that TheDemon still can't take two of us on and win. We'll both keep attacking and if he does too well against one of us then the other will move in to threaten his cap. Which is exactly what happened here. TheDemon was threatening my cap but he had to pull back to defend because Sauromatia had moved a big army onto the southern tip of the island. I'm greatly aided here by the fact that the province on my side of the bridge is a swamp. What this means is that TheDemon can't move from my cap back to his side of the bridge in one turn. His Palankasha will get stuck in the swamp for a turn. Without the swamp, he might be able to barely pull off sieging my cap and then pulling back to defend. With the swamp he's stuck coming just over the bridge before being forced to pull back. The big problem with my plan is that if TheDemon can somehow do enough damage to both of us in succession that he can effectively eliminate one of us then we're both dead. By defending such a small island he has an ideal position from which to play with defensive movement, bringing his entire force to bear on each of our forces in turn.